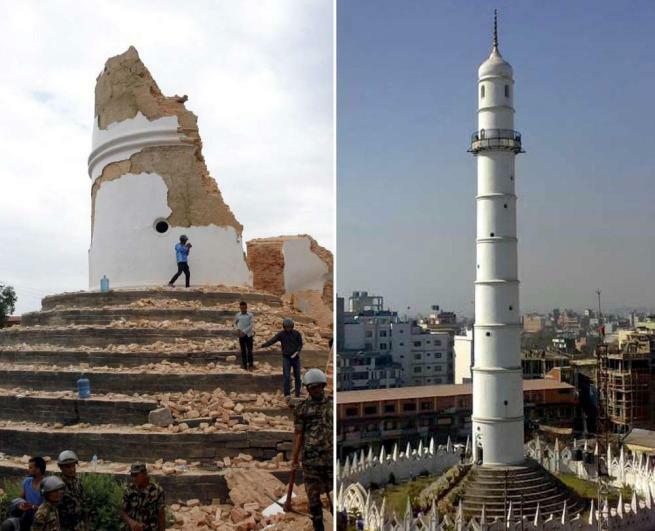 Home > News > April 2015 Earthquake: Restoration of Nepal Heritage Sites Begin! Continuous efforts by Nepal Government towards the reconstruction of heritage sites damaged in the April 2015 earthquake are taking their implementation form. As the latest updates show, the National Reconstruction Authority (NRA) seems to be making fast moves towards restoration of the quake-hit structures. While some of them have begun, some are in the process to begin and various others are yet to make their way. A three-year-long wait has finally turned positive for the historical Kasthamandap that has been awaiting reconstruction after it was hit by the April 2015 earthquake. 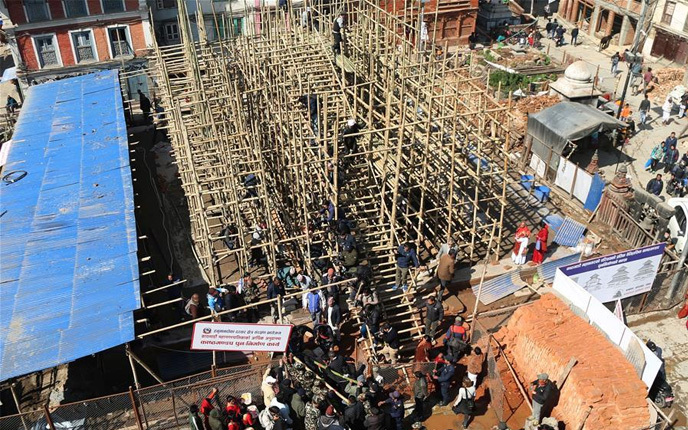 Overcoming delays in approvals and fund assistance, the reconstruction of Kasthamandap has officially begun at Hanumandhoka Durbar Square in Kathmandu on February 10, 2019. A special event was held to mark the reconstruction of this oldest structure, where people carried wooden pillars for erection at the reconstruction site of the Kasthamandap temple. Kathmandu Metropolitan City Mayor Bidhya Sundar Shakya graced the occasion. A step ahead in the revival of age-old structures destroyed in 2015 earthquake, the Kathmandu Metropolitan City department gave its nod for the reconstruction of iconic Kasthamandap. Towards this end, KMC Mayor Bidya Sundar Shakya handed over a cheque worth Rs 50 million to the Kasthamandap Reconstruction Committee (KRC) on October 13, 2018 and informed that the work would start in the current fiscal. It’s been more than three years that the site has been awaiting reconstruction, which couldn’t begin due to disputes among the Department of Archaeology, KMC and the local community over the execution process and financing. The work hasn’t started yet despite the Minister of Culture, Tourism and Civil Aviation Rabindra Adhikari inaugurating the reconstruction work prior to the formation of KRC. The work would not stop anymore as the community is working collectively, Shakya said earlier. However, the implementation is finally turning into reality! 2) Glorious Dharahara Rising Again! On December 27, 2018, Nepal Prime Minister KP Oli Sharma laid the foundation of Nepal’s historical structure Dharahara, marking the beginning of its restoration. As per the new design, the candle-like tower will house a mini theater hall, food court, museum, musical fountain, stone water sprouts, and souvenir shops. The Nepal Government has invested an amount of NPR 3.45 billion for the prestigious project which will be established in two years, if everything goes according to the plan. Speaking at the occasion PM Oli said that the new Dharahara will resemble the original tower but the construction will have a modern approach. He also asked the construction company to leave no room for error in the project. “Once the Dharahara is built, both children and the elderly will be able to use a lift. After two years we will be able to see a green and beautiful Valley from atop the new Dharahara,” Oli added. According to Nepal National Reconstruction Authority (NRA) the tower covers an area of 21,267 sq.m and will be 75 meters in height. The structure will be a 22-storey building but will be made to like a 11-storey building on the outside. As per Reconstruction officials, the remains of the tower from the 2015 earthquake will be preserved under a glass-covering. The new Dharahara will stand next to the base of the old structure. The Dharahara reconstruction project has been awarded to Raman GIETC joint-venture. It was originally built by Nepal’s then Prime Minister Bhimsen Thapa in 1825 and was destroyed by two earthquakes in 1934 and 2015, respectively. 3) Largest Library Back to Life! In a major step preserving rich Nepali culture and literature, a local firm has rebuilt a significant structure damaged in the 2015 earthquake. Called as ‘Madan Puraskar Pustakalaya’, the library building is home to the country’s largest archive of historic Nepali books and various age-old documents with rarely-available information on Nepali literature. 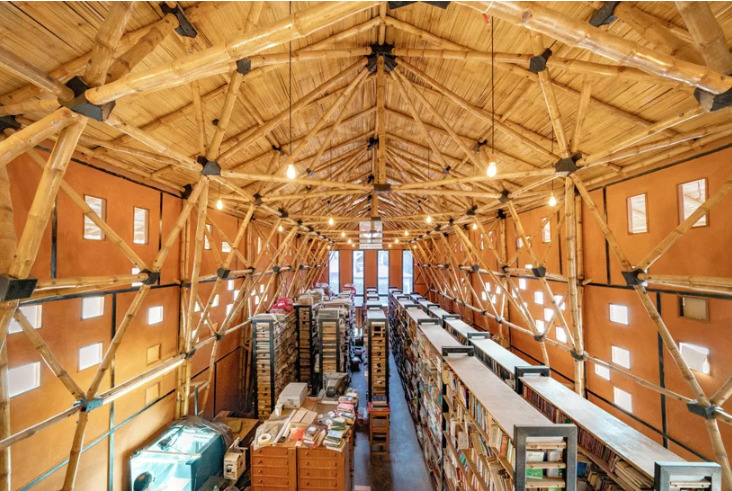 ABARI, the builder, has given the magnificent architecture its due respect by designing it in complete bamboo style in the vernacular structure reflecting the local tradition, using the site’s original foundation that survived the earthquake along with some of its historic bricks. “The old surely set the foundation for the new in this case,” says Nripal Adhikary, ABARI Founder & Chief Designer. “We have been able to identify a few districts in Nepal ideal for growing and producing bamboo suitable for construction, and, over the past five years, have been working with farmers’ cooperatives to build a network of bamboo producers, eventually buying back from them,” Nripal adds. The construction was so interesting that the builders made it earthquake-resilient with bamboo and rammed earth materials. Prime Minister KP Sharma Oli inaugurated the restored historic structure Gaddi Baithi amid a special function in Kathmandu on June 28, 2018. 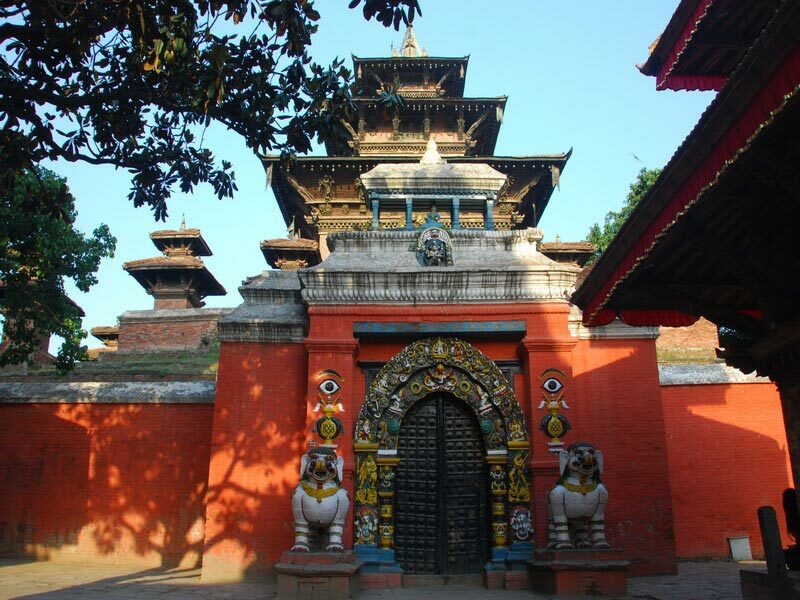 Gaddi Baithak, meaning ‘Royal Seat’, is Nepal’s one of the most important historical structures built in 1908. This was the place where many Nepali kings were crowned and the royalty used to welcome the Heads of State and other high-ranking foreign guests their visit to the country. Over the years, the site gained popularity from the world tourists and eventually got listed as the UNESCO World Heritage Site. Three after the damage in 2015 earthquake, the building was rebuilt with traditional materials like timber wood, mud mortar and bricks, among others. The reconstruction involved engineers and architects with expertise in earthquake resilience and preservation & restoration of heritage sites. Besides Gaddi Baithak, the day also saw the inauguration of four other ethnic Newari-style architectural monuments in and around the historical Durbar Square. Kathmandu-based locals, culture experts and heritage conservationists had earlier raised a serious opposition to Department of Archaeology (DoA)’s approval to demolish Baghdurbar. Against KMC’s move towards call of tenders for demolishment, the city-based stakeholders had reportedly called for a protest outside the iconic site. “We want to prevent this wrongful act. Baghdurbar is part of our heritage. A study has already concluded that the building could be retrofitted, but the metropolis and the archaeology department are after demolishing it,” Chanda Rana, Coordinator of Save Heritage Campaign, said in a statement. DoA took a decision to retrofit and restore the site after a two-year-long technical assessment post the 2015 earthquake that damaged the site. KMC officials opine that the retrofitting costs are higher compared to that of the demolishing and rebuilding the age-old structure from scratch. The National Society for Technology denies the argument as its senior technical adviser says that the retrofitting needs only 35 percent of the total amount required for new construction. Architect and Former Dean of the Institute of Engineering of Pulchowk Sudarshan Raj Tiwari also feels the same. “If Gaddi Baithak of Basantapur can be restored through retrofitting, Baghdurbar can also be restored in a similar manner. After all, Baghdurbar had suffered less damage than Gaddi Baithak,” adds Tiwari. Rana makes it very clear that they will not let the metropolis demolish the building. “We have already saved around three dozen quake-damaged palaces from getting demolished and we will be successful in saving Baghdurbar as well,” he adds. The reconstruction of iconic Maju Dega Temple in Basantapur destroyed in the 2015 earthquake has begun, informed KMC. Sundar Shakya announced the commencement of this project at a program in Kathmandu on October 29, 2018. The project involves an estimated expenditure of NPR 55 million. Built in 1690 BS, Maju Dega Temple holds a rich history dating back to the period of Riddhi Laxmi, grandmother of the late King Bhupalendra Malla, of the heroic Malla Dynasty. Meanwhile, NRA has also finalized the rebuilding model for the iconic Bal Gopaleswor temple in the middle of Rani Pokhari. NRA has reportedly directed architects to come up with new model following the Granthakut design. The Authority opted for Malla-era design owing to disputes over reconstruction modality among locals, culture experts and government officials. The temple was actually built in Granthakut design in 1670 by the then King Pratap Malla and was later rebuilt in the Gumbaz model by Rana rulers after a damage in 1934 earthquake. Now, after 2015 earthquake, officials, locals and culture experts started demanding for reconstruction in the original Granthakut style. However, few raised concerns on whether the original temple was built on Granthakut design. Further NRA has directed heritage conservationists to come up with a design in Granthakut style. “But, we are yet to hold a round-table meeting with culture experts and locals,” said Raju. Meanwhile, the former Director General of Department of Archaeology Bishnu Raj Karki says there are high possibilities for Granthakut design. The historical Rani Pokhara is also undergoing severe delays linked to bidding process that drew submissions failing to meet the project criteria. There has been a heated discussion around the reconstruction of Rani Pokhara, where, the Department of Archaeology said the blue print for reconstruction was planned against the approved blueprint. The locals had also protested against the use of concrete and modern materials in the reconstruction process. The Kathmandu Metropolitan City (KMC) has earlier reported its plans to demolish the capital’s historical Haribhawan in Sundhara. The department had planned to do so for Haribhawan’s demolition and reconstruction of Ranipokhari in Ratnapark at once, Nawaraj Dhakal, KMC Assistant Spokesperson said in a statement. In this regard, the department has already called for project quotation to expedite the reconstruction process. The decision has been pending since a year as the country’s Department of Archeology (DoA) stopped the move. Haribhawan has a historical background of more than 100 years and has been used for KMC’s operations since 2003. 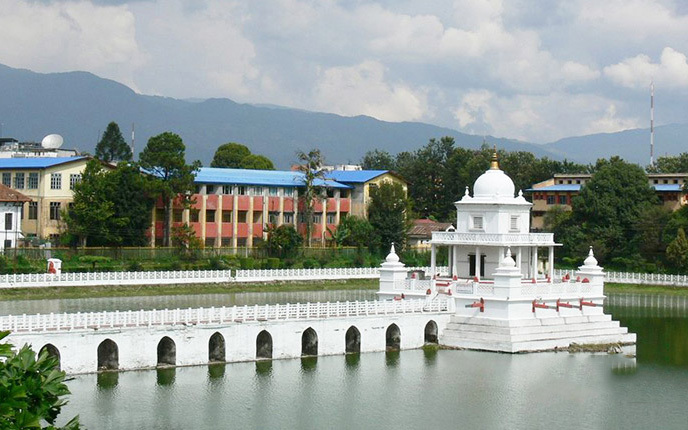 Whereas, Ranipokhari holds a historical record of more than 400 years and has been pending for reconstruction after public protested over usage of modern material in the rebuild activity. 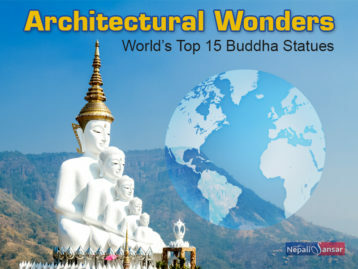 According to the Department of Archaeology Nepal, while a total of 753 shrines, monasteries and temples suffered the damages across the country, Kathmandu alone saw the damage of 241 temples and shrines, followed by 130 in Patan and 73 in Bhaktapur. Out of the damaged temples, 83 temples have already been reconstructed and 56 are in multi-year plan, informed Bhesh Narayan Dahal, Department’s Director General. The Department has already announced 17 tenders for the renovation of rest of the temples, Bhesh added. Bhesh further informed that the renovation of Changunarayan temple was completed at a budget of Rs 30 million. Completion of the reconstruction of Taleju temple, 90 percent renovation of Swayambhu-based Anantapur temple, ongoing renovation of Nautale Darbar located at Hanumandhoka at the initiative of Chinese Government are among other reconstruction and renovation projects. 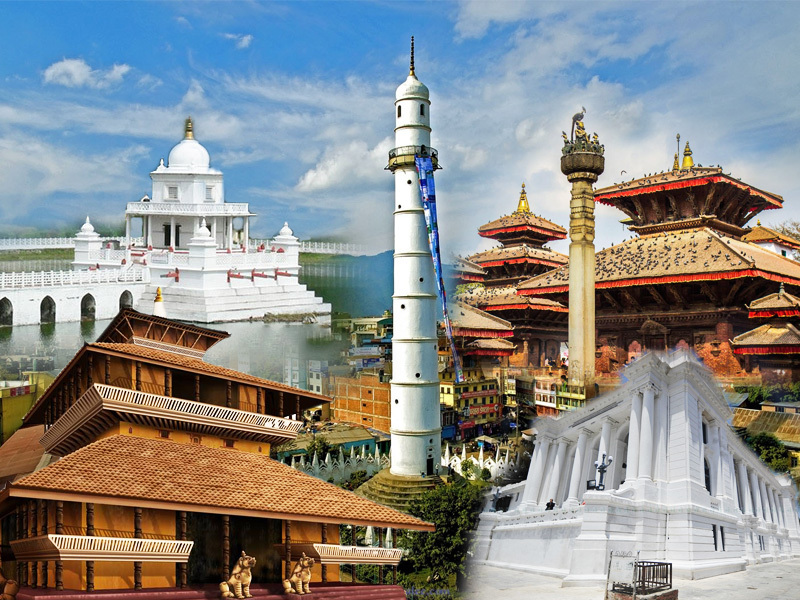 Meanwhile, the Sri Lankan Government has been carrying out reconstruction of Bungamati-based Rato Machhindranath Temple and is set to finish the process in two years, and the Kathmandu Metropolitan City is taking care of the Kasthamandap reconstruction activity. According to a release on September 2017, the US Embassy has promised of offering a financial assistance of USD 500,000 (Rs 50 million) for the restoration of Kaiser Mahal Palace and Char Narayan Temple at Patan Durbar Square. According to the US Embassy’s official release on August 14, 2017, these two sites bagged the current year’s Ambassador Fund for Cultural Preservations (AFCP) in a global competition and the grants for their restoration (south wing of the palace and the temple) were awarded to Impact Foundation and the Kathmandu Valley Preservation Trust (KVPT). 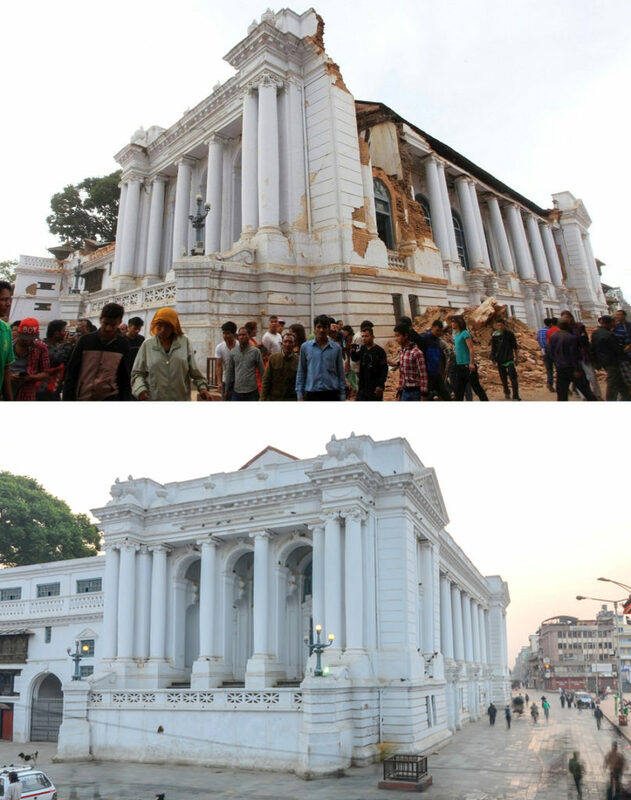 “The project will stabilize, seismically strengthen and support urgent restoration work needed to repair the neo-classical Rana style building built in 1895,” the Embassy said in a release. While Impact Foundation is set to receive a sum of USD 400,000 for the palace project, KVPT will get USD 100,000 for the restoration of the historic temple built in the Malla era. The US Embassy Charge d ’Affairs Michael Gonzales expressed US’ commitment towards protecting Nepal’s unique cultural heritage. 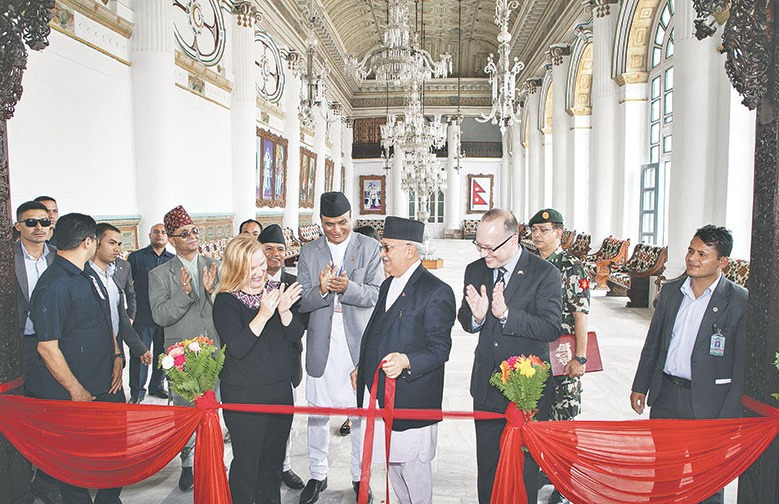 “The restoration of buildings like Gaddi Baithak that began in September 2016 through US support and the Kaiser Library is key to preserving historically-significant neo-classical buildings damaged in the 2015 earthquakes, “says Michael. Established by the US Congress and administered by the Department of State, AFCP has been supporting the preservation of cultural sites, cultural objects and forms of traditional cultural expression since 2001. 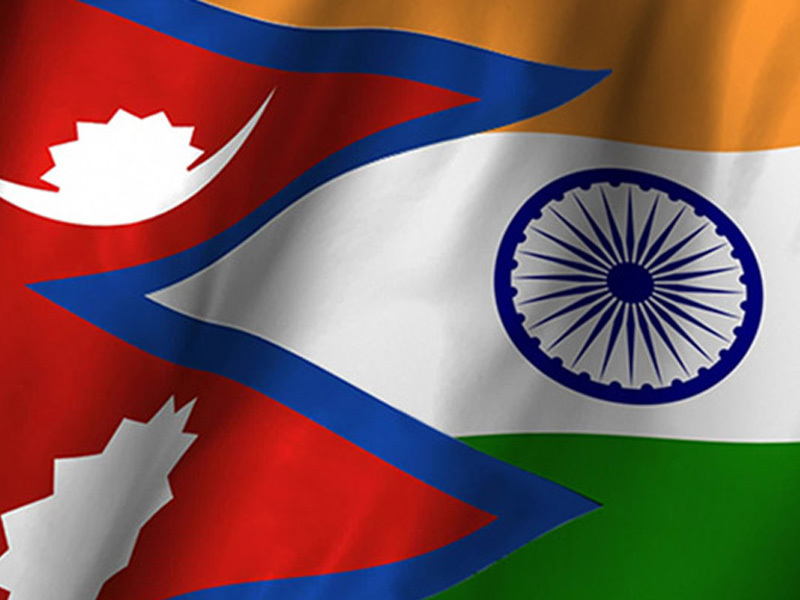 So far, it has supported 22 projects in Nepal through the US Government grant of USD 3.4 million. 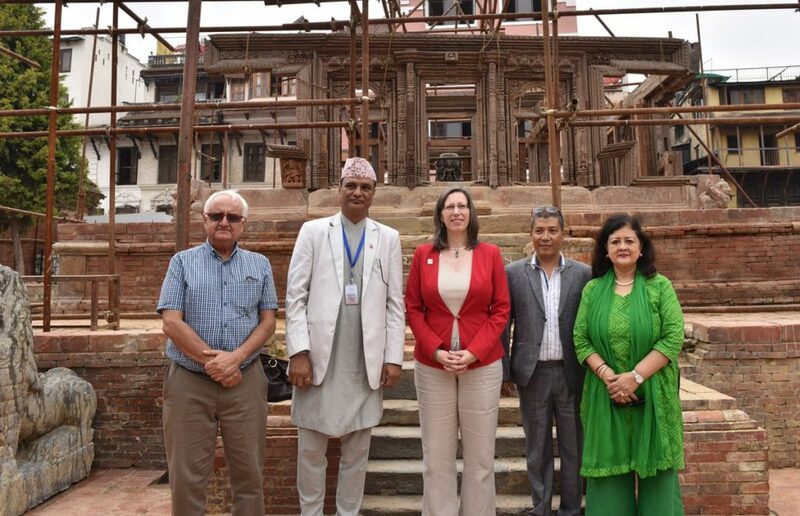 Nepali Minister for Culture, Tourism and Civil Aviation Rabindra Adhikari is hopeful that the government would complete the reconstruction of majority of the quake-hit historical structures and monuments before Visit Nepal Year 2020. Will have to wait and watch as to know what gets finalized! Nepal 2015 Earthquake: Three Years of a Sad Story! Hero Women’s Football Gold Cup 2019: Nepal Bounces Back, Stands 2nd in the List!